Discussion in 'Vapor Related Equipment' started by JCat, Nov 20, 2018. The 1st revision (beta) of the FC E-Nail by JCat is now complete. 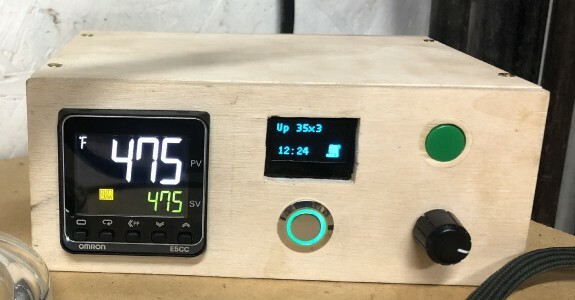 I decided to start a new thread for this, since it's really a project of it's own (what I envisioned for a better enail controller). Cost to build these is ~$200. Cost will come down if doing batches, but this is the cost sourcing most parts from Canada, and the Omron E5CC-QX2ASM-802 from AliExpress. It's free to use the code for personal or educational purposes, but not for commercial ones. If you wish to use it commercially, please contact me. I may in the coming months have some kits available, as I would really like to see these get into the hands of some community members Cost for these kits would likely be $250-$300. Justpassedu, IAmKrazy2, Been Vapin and 31 others like this. Justpassedu, gunmetalshark, lazylathe and 2 others like this. The filament was purchased in Italy, kanesis is the company producing it. But I do believe it can also be sourced in the US. Great to see something like this take shape!!! Phenix, gunmetalshark, lazylathe and 3 others like this. Justpassedu, Hogni, lazylathe and 6 others like this. As I said in the other thread, sign me up! I can either build or buy pre-built or partial built. I need this in my life. gunmetalshark, lazylathe, ataxian and 2 others like this. Just an irregularity that struck my eye. At around 5:00 the on/off button on the phone quickly goes off and then on again. gunmetalshark, lazylathe, ataxian and 1 other person like this. I really think this will step up the dab experience for flavour and effect. The possibility of scripts and presets is great. edit: Sorry for the 2 consecutive posts back-to-back, but I suddenly thought my comment might come over as negative criticism. Which would not be my intention. gunmetalshark, Hogni, lazylathe and 2 others like this. gunmetalshark, Hogni, lazylathe and 5 others like this. I completely agree. The main unit doesn't seem to act different in any way. It doesn't affect the use in this video. lazylathe and ataxian like this. Jill NYC, lazylathe, ataxian and 2 others like this. @JCat Wow. I didn't expect that you would fix this. Now another thought, that was lingering a while, came up again. Please consider this brainstorming, far fetched thought. Now that we have a computer in this unit. Is there a way to detect if the coil touches something unusual and somehow acts weird? Maybe it would be possible to detect if it cools too fast or heats faster than normal and then the computer could give an alarm or even shut down the coil? Would be a unique safety feature, I think. Just ignore at will. You already invested a lot of time and effort! Hogni, lazylathe, ataxian and 1 other person like this. Im totally interested in one of these if prebuilt, have right pin output, and end up being available to community members. 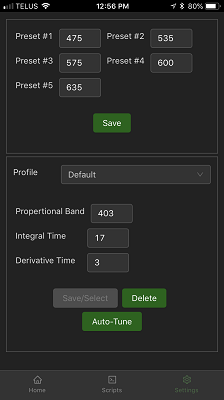 Would want it to work with 710coils stuff, but I have an idea for a function it could have if you are thinking of adding more. You could add an auto off that resets every time the temperature changes (since it always moves when you dab) so it could be set to say 30 minutes than if you take a dab the temperature would change and reset the 30 minutes so it would only auto off after 30 mins of no temperature change/dabbing. Hogni, lazylathe, ataxian and 2 others like this. I like the idea of a timer auto off too. But it doesn't sound safe to me yet to couple the reset with the temperature. Maybe a "dead man switch" solution? lazylathe, ataxian and JCat like this. Anyways ... that one's a pipe dream. Jill NYC, Hogni, lazylathe and 3 others like this. There is no need for 100% accuracy. They tried something similar in the Crafty and Mighty, but it only works poorly. As you say there are many variables. It depends on the draw speed, outdoor air etc. From what I can see with my cheapo well-tuned enail controller and a couple of tries, there is no way to detect a draw half way consistently, as you said. To detect if the coil touches something unusual (like my wooden table) could be easier. There is more happening temperature wise when I do, than when I take a draw in my setup. It is not enough to say anything just by knowing the temperature development alone. You know the temperature of the coil at every moment. You say you know heat output too? What do you measure? Energy or current going into the coil? Or just coil on/off? Sorry for my ignorant questions that you most probably already explained somewhere. 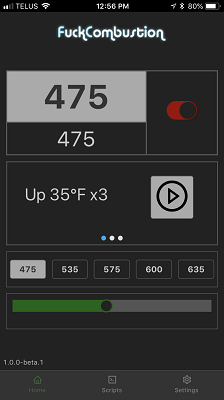 There might be a possibility with these 2 values and it would not work 100% accurate, it would not work with all setups and it would probably need calibration by the user. But only 1 fire prevented would be worth it. It is a experimental feature that could be added later on, the controller has everything it needs, I think. I am unfamiliar with PC or raspberry environments and out of the game for programming since a long time. So it will stay a pipe dream most likely, which is no problem. But it sure is teasing me. Auto toke detection works well on a crafty and mighty if you have a decent set of lungs and take a good hit. It’s just not super sensitive since it’s detecting the heater cooling faster then from ambient temperature. I bet you figure it out. Dropping a cap on a nail would probably do the same thing tho. lazylathe, Sick Vape, ataxian and 1 other person like this. lazylathe, Sick Vape and ataxian like this. Seems like you would need some way to measure airflow between the nail and the piece. Neat idea, another Hexnail vaporware feature that never materialized but in the grand scheme of things probably not that important. 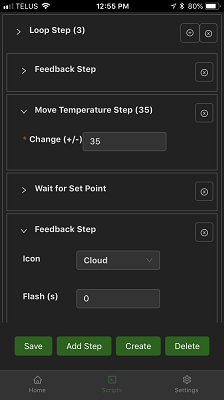 Consistent temps, a good self calibrating feature, mobile/web app and the scripting feature are super high points for this project. I'm stoked for this. I'd send money right now for a kit or assembled unit. Even in it's infancy, this thing is incredible and the development progress shows what you can do when you're not just dabbing all day and stealing people's money. Hogni, lazylathe, tennisguru1 and 1 other person like this. You are right. It is because I prefer smaller draws. I probably could make it work better with taking big draws and coughing my lungs out. But for a S&B unit, I want one that can fit my needs, not the other way round. I have no problem with the Crafty, I can just hit the button before it wants to switch off. And an auto off like @JCat intends covers the security aspect good and for all possible setups. It is a wonderful unit as it is now. lazylathe and JCat like this. If 1 or 2 other people are interested I'm planning on building 3-4--1 more for myself, and 2-3 for other people with standardized parts and a proper case--either 3D printed or aluminum with front/back pre-cut/drilled for components to give a proper finish. This would allow me to fully document all required components and nail down the build to be able to offer kits (or if I decide to take it to the next stage of building proper/full units with actual CSA approval). I have all parts on order to build units apart from the custom case and the Omron units. Anyone that wants in the deposit will be $200 USD and $100 more on completion. Jill NYC, Hogni, pxl_jockey and 3 others like this. Im in. Just let me know. You're the only one so far ... If I don't have any other interested soon, I'll go ahead and order just 2 of the Omron and I'll just be building those 2 for the next round. I have at least 4 or 5 of every other part already on order a week or two ago. Hogni and pxl_jockey like this. The other one toggles the power on/off on the coil though, so the "extra" one that physically turns it on/off isn't required. I'm planning on putting a coil switch at the back though, just not as accessible on the front.